Join Us on April 1st! A limited number of full scholarships are available to students. Please e-mail Amy Holland at aholland@wacmaine.org for more information. Please click here if you would like to sponsor a student to attend the summit. 8:30-9:45 Session 1 "Working Globally, Building Capacity Locally"
10:00-11:15 Session 2 "Profiles of Maine's Global Health Care Leadership"
1. 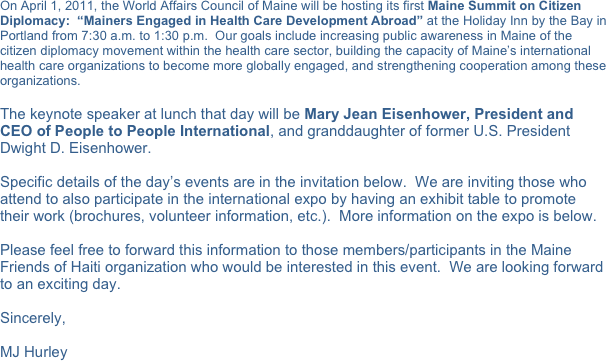 To increase public awareness in Maine of the citizen diplomacy movement within the health care sector. 2. To build the capacity of Maine's international health care organizations to become more globally engaged. 3. To strengthen cooperation among these organizations. Members of the health care, nonprofit, business, academic, local government, civic, religious, and international exchange communities, and the media, will come together at the summit to promote citizen diplomacy and its importance in our global interdependent world. College/university students interested in health care and international development are particularly encouraged to attend. Attending organizations have the opportunity to rent exhibit tables ($25) for promoting their organizations, networking with other attendees and displaying/selling their promotional items in our exposition. Please click here to register and reserve your table! This Summit on Citizen Diplomacy has been initiated through a seed grant from the National Council for International Visitors as part of its 50th Anniversary celebration. Click here to become a member of the World Affairs Council of Maine. For more information about the Summit on Citizen Diplomacy or any programs of the World Affairs Council of Maine, please contact Amy Holland at 207.221.4386 or aholland@wacmaine.org.